Benedict Funeral Directors offer Dunstable a first class service at a competitive price. Benedict Funeral Directors offers a first class undertaker services at a competitive price to the residents of historic Dunstable. Being a family run Undertakers brings certain advantages with it, namely you are assured of our personal touch; total respect, honesty and compassion. Part of that respect is to let you know your options; funerals are one-off events and they can be relatively simple or very extravagant. Whilst our funeral homes, and our chapels of rest, are in Arlesey and Houghton Regis, it takes only a short while to drive to Dunstable. The money saved and service offered by Benedict Funeral Directors makes this drive very worthwhile. It should also be remembered that, apart from the Chapel of Rest, Benedict Funeral Directors will always come to you. Dunstable is usually served by The Vale Cemetery & Crematorium. The full address is; Vale Cemetery & Crematorium, The Vale, Butterfield Green Road, Luton, Bedfordshire, LU2 8DD. Whilst Luton Crematorium is older than the beautifully modern Crematorium such as the one in Stevenage, it is very well maintained and presented. An alternative crematorium is Bedford Crematorium, located at 104 Norse Road, Bedford, MK41 0RL, for families requiring a slightly larger facility than that offer at Luton; (for funerals whereby a very large amount of people are expected to attend). Of course cremation is not the only option; there are different cemeteries available for burial (as opposed to being cremated). Benedict funeral Directors are more than happy to discuss this with you. Dunstable has a large Catholic Church located at St. Mary’s Catholic Church, 82 West Street, Dunstable, Bedfordshire, LU6 1NY. 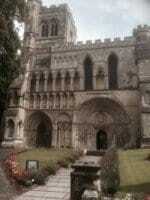 Dunstable also boast a very historical church dating back to 1131, called The Priory Church of St. Peter. This magnificent church was founded by King Henry 1. The full history of The Priory can be read by clicking on this link. The Priory Church of Saint Peter address is Church Street, Dunstable, Bedfordshire. Subject to receiving permission of the relevant clergy in charge, funerals services can be held at these or other religious establishments in Dunstable. Call us on 01582 249268 .